I love Instagram. It's such a fun tool to connect to other creative minds. Of course I'm pretty addicted to my phone, mainly because of this app - but hey, I'm working on that - aren't we all? ;) Since Instagram launched IGTV (InstaGram TeleVision) almost two months ago I've been discovering the way it works and I'd love to share my findings with you. I also love to share a few easy editing tips to make your IGTV episodes stand out! First of all you need to download the separate app. I've had some friends who totally missed my IGTV episodes, because they hadn't downloaded it yet. IGTV is different from other video platforms, mainly because the videos are not horizontal, but vertical! No more flipping your phone when filming or watching. Instagram made the use of IGTV very similar to a regular TV. As soon as you open the app, it starts playing. You can still scroll and go back and forth though, no worries. And if you don't like what you see, you can swipe through, just like you would zap between TV-channels. To me IGTV came at the right time. I felt like I wanted to start vlogging, but somehow wasn't feeling the YouTube vibe. I knew video was one of the best ways to show yourself marketing-wise, so I jumped right on the IGTV wagon! Here are a few of my latest vlogs. (In order to post them here, I had to upload them to YouTube, as IGTV doesn't have the embedding option). 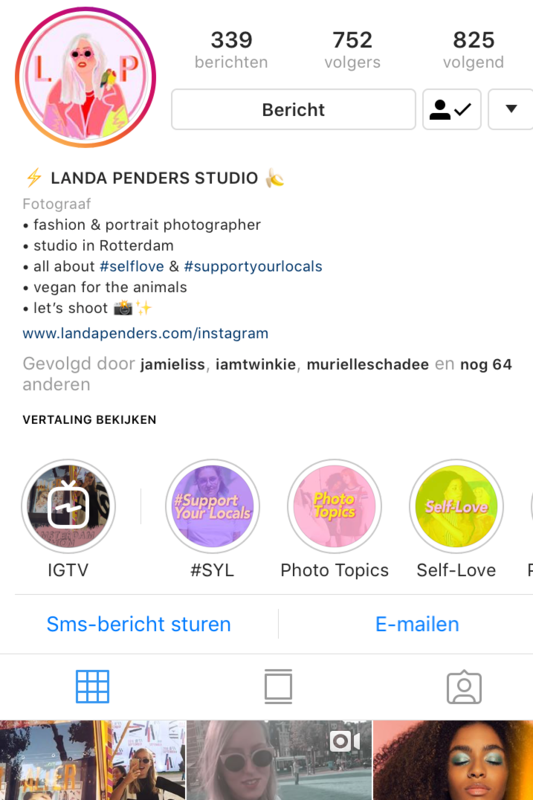 If you're interested in viewing my IGTV channel, you can find it via my Instagram account @landapenders. As you can see I've really implemented my own branding in the videos, including my own 'network logo' in the corner. What I love about IGTV is that it doesn't have to look super smooth and crisp. By filming with your phone you can make it look like you're really showing a sincere part of your work or life. And I think that filming vertically also adds to that feeling of authenticity. There are a few ways to edit videos for IGTV! I'd like to share how I do it, so you can make it your own. All I use are my iPhone to film, iMovie on my MacBook to edit and Adobe Photoshop to design the funky overlays. After transferring your filmed material to your laptop, either by syncing the cloud or plugging your phone in, I open iMovie to edit. If you've never worked with it, it might take some time to get to know the program. 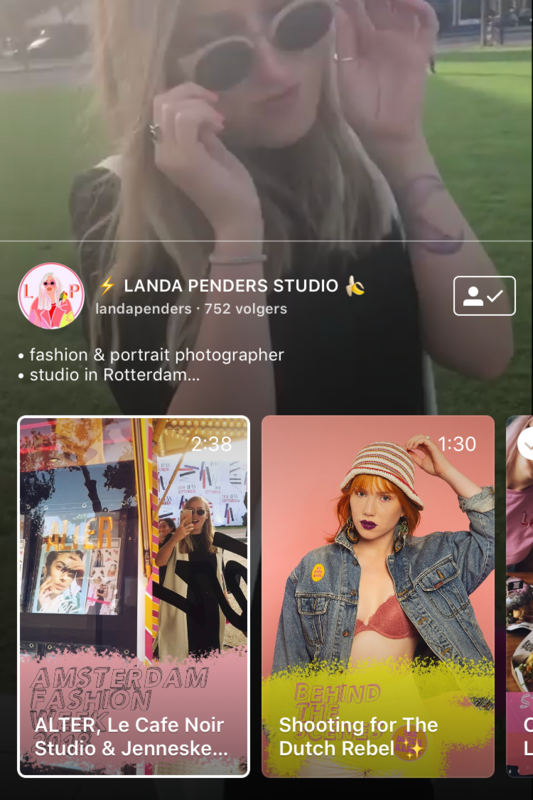 It's a very easy to use program and not what professionals use, but for IGTV it might just be perfect. You'll see that iMovie only edits the vertical film with black sides next to it. This is not what you want, but for now just edit the film the way you like it! When you're done, select all of the clips and go to the 'crop menu'. Here you can rotate all clips at once. Which way doesn't really matter for now. Forget about using your favourite song in the video. Video platforms have song detection software and there's copyright on most songs. But there are royalty free music libraries all over the interwebs. My favourite is the audio library YouTube provides. Listen, download and import! Want your brand logo in the corner? Or some funky overlay with a fun font? Get creative in Photoshop. The size of the file should be 1080 x 1920, or 9 : 16. If you want it as an extra layer on top of your film material, make sure you add transparant parts in your design. Save the file as a PNG! Then import the file into iMovie and add it to the top layer of your time line, right above your clips. You will see that it needs to be rotated too. The Ken Burns effect is probably effective, but slide both the start and the end point of the effect to the same size and you have a nice overlay. IGTV episodes need to be saved as an MP4, so just export the film as a 'file'. When the export is all finished, you can use Quicktime to rotate the film back to make everything straight up again. Pretty easy! When your film is finished, you can upload it via your computer. Add a description and a cover and then put it out there! If you're like me you keep watching the movie 10 times, until you're sick of it, haha. I hope these quick tips will help you make fun IGTV episodes. Do you think they can be helpful? I have a lot of fun making mine and hope that shows! If something is unclear or you have question, do not hesitate and post your question in the comment section below. I'd love to help! What's your opinion of IGTV? Do you love it or hate it? and receive the latest updates & articles. Let's keep in touch!